At a meeting in Washington last week, National Aeronautics and Space Administration (NASA) and European Space Agency (ESA) officials decided to continue pursuing studies of a mission to Jupiter and its four largest moons, and to plan for another potential mission to visit Saturn’s largest moon Titan and Enceladus. Both of these proposed missions are grand endeavors that set the stage for future planetary science research. These outer planet flagship missions could eventually answer questions about how our solar system formed and whether life exists elsewhere in the universe. The missions, called the Europa Jupiter System Mission and the Titan Saturn System Mission, are the result of NASA and ESA merging their separate mission concepts. NASA originally studied four mission concepts during 2007, which were narrowed down to two proposals in 2008. One finalist was a Europa Orbiter to explore that icy moon of Jupiter and its subsurface water ocean. The other was a Titan Orbiter to visit the Saturn moon. Independently, in 2007, ESA also initiated a competition to select its flagship mission for the Cosmic Vision 2015–2025 slot of the ESA scientific program. Two finalists, called Laplace and Tandem, were selected by ESA for further study. Laplace was a set of spacecraft to orbit Jupiter and eventually orbit and land on Europa. Tandem was a set of spacecraft intended to orbit Titan and explore its surface, after also exploring the surface of Saturn’s moon Enceladus. NASA and ESA engineers and scientists carefully studied both potential missions in preparation for last week’s meeting. Based on these and other studies as well as stringent independent assessment reviews, NASA and ESA agreed that the Europa Jupiter System Mission, called Laplace in Europe, was the most technically feasible to do first. However, ESA’s Solar System Working Group concluded the scientific merits of this mission and a Titan Saturn System Mission could not be separated. The group recommended, and NASA agreed, that both missions should move forward for further study and implementation. The Europa Jupiter System Mission would use two robotic orbiters to conduct unprecedentedly detailed studies of the giant gaseous planet Jupiter and its moons Io, Europa, Ganymede, and Callisto. NASA would build one orbiter, initially named Jupiter Europa. ESA would build the other orbiter, initially named Jupiter Ganymede. The probes would launch in 2020 on two separate launch vehicles from different launch sites. The orbiters would reach the Jupiter system in 2026 and spend at least three years conducting research. Europa has a surface of ice, and scientists theorize it has an ocean of water beneath that could provide a home for living things. Ganymede, the largest moon in the solar system, is the only moon known to have its own internally generated magnetic field and is suspected to have a deep undersurface water ocean. Scientists long have sought to understand the causes of the magnetic field. Callisto’s surface is extremely heavily cratered and ancient, providing a clear indication of a record of events from the early history of the solar system. Finally, Io is the most volcanically active body in the solar system. The orbiters would spend nearly a year orbiting Europa and Ganymede. NASA’s probe would investigate whether Europa might harbor life, and ESA’s spacecraft would orbit Ganymede to conduct investigations of the surface and interior of this satellite, to better understand the formation and evolution of the jovian system. 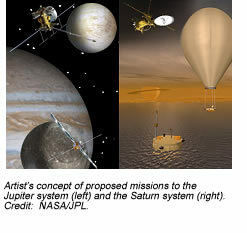 The Titan Saturn System Mission would consist of a NASA orbiter and an ESA lander and research balloon. The complex mission faces several technical challenges requiring significant study and technology development. NASA will continue studying and developing those technologies. Future work also will provide important input into the next Planetary Science Decadal Survey by the National Research Council of the U.S. National Academy of Sciences, which will serve as a roadmap for new NASA planetary missions to begin after 2013. On the European side, the interested community of scientists will have to resubmit the Titan mission at the next opportunity for mission proposals in the Cosmic Vision program in the years to come.